I'm really liking the way this set looks on this guy! I've got the breast collar pretty much done, it just needs to be sewn together. 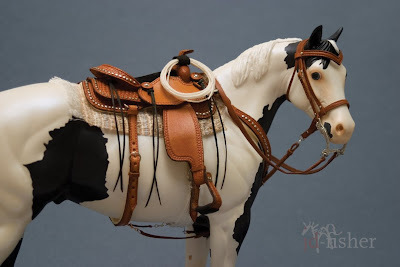 Of course I've saved my least favorite part for last—the string cinch. I don't know why, but I really dislike making them. 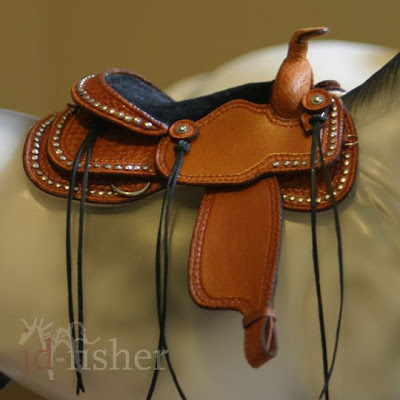 I should make a bunch and keep them on hand so I don't have to make one every time I make a saddle. Of course after I get done with the first one, I've just about had enough! Once I've wrapped up these final touches and taken some good photos, it's off to auction! 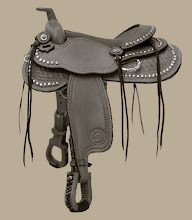 Here is a quick look at the progress I've made on my new studded saddle. It's currently missing stirrups, but I hope to have the entire set finished soon. 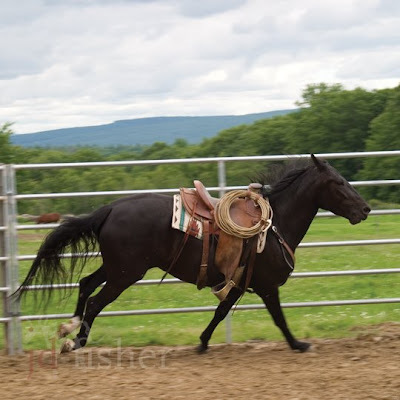 In other news, this past weekend I got to attend a Tom Curtin clinic. Fascinating. I've never been to a clinic before, and now wish that I had entered Mia. It would have done the two of us some good. Oh well, maybe in the fall. But still, I think I learned a lot. Once the dye has completely dried the next step is to rid the edges of any 'fuzz'. 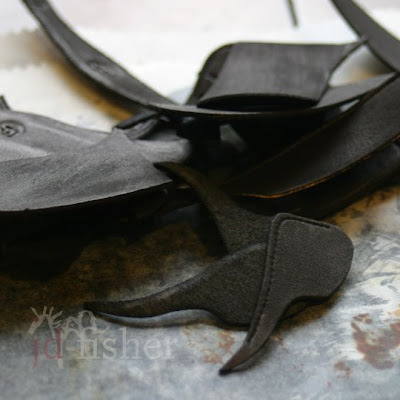 Followed by sealing each piece with a leather finish. 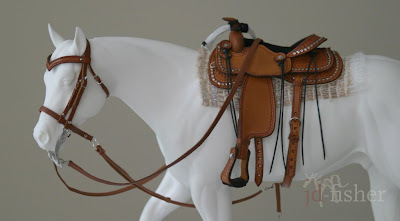 After the saddle is complete, I will add another layer of finish. 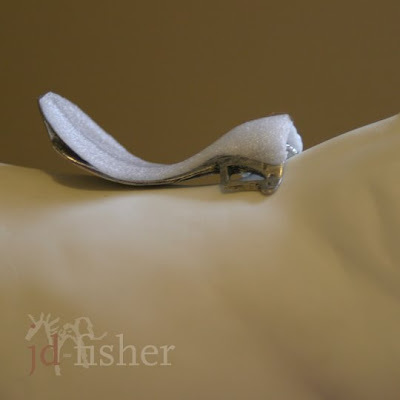 Since this is a dressage saddle, my saddle tree will have to be modified a bit to form the tree into a proper deep seat. I've done so on this tree using layers of foam. I haven't tried it this way before, so we'll see how it goes. Next it's time to piece everything together! I'm currently working on multiple projects at the same time, so that as i wait for glue or dye to dry one one, I can still be productive on others. Normally this multitasking doesn't work very well for me, as I am so easily distracted, however I currently feel a bit inspired by several things. Which of course is working to my advantage. 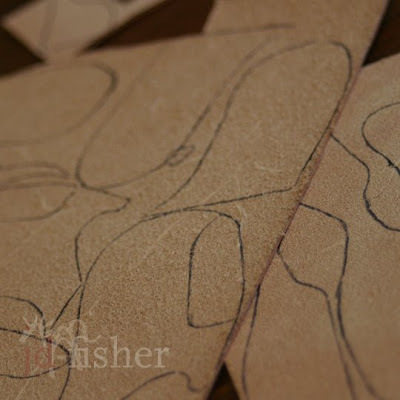 I begin with a pattern made from cut paper, which I trace onto the leather. 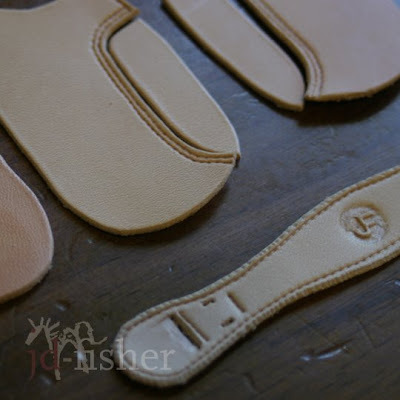 I always mark any flaws in the leather on the backside, so that they don't end up on the top finished panels. 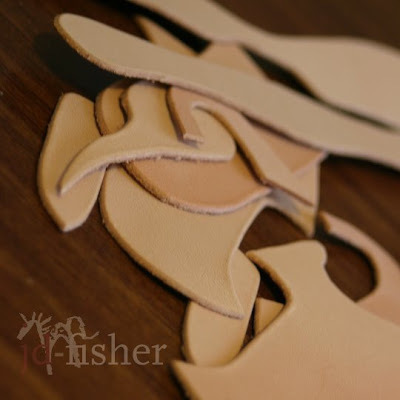 I've also had issues in the past with the tooling leather darkening when left out (oops, left window shade up), to the point where the pieces couldn't be used as the color was not even. Of course for dyeing black, these are perfect. After trimming all the pieces out and tooling them as needed, they are then dyed to suit and left to dry.